Dubophonic introduces Mexican Stepper. Born in Mexico, Yasser Serano has been into music since his childhood. His anxiety to contribute to the reggae and dub scene led him into participating in many festivals in Mexico with important recognitions. Tapping into different rhythms but mainly with stepper productions, Yasser introduces 2009 his Mexican Stepper project with the intention of creating a new dub proposal in his homeland Mexico. Little he knew that his sound would soon overcome the borders of his country and spread like a virus all around the world. Living proof of this is the willingness of many artists from all around the world to join his effort, offering their own musical interpretations on Yasser’s tune. 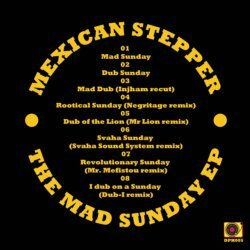 Mexican Stepper’s first EP consists of the title track “Mad Sunday”, a hard stepper tune with an ethnic feel, accompanied by an ever so exiting dub cut. Just to step it up a bit more, we included some exclusive remixes by artists who were already introduced on previous releases like Dub-I (RUS) and Negritage (ARG), but also by Dubophonic newcomers Svaha Sound System (UK), Injham (FR), Mr. Lion AKA Jahstyle (CAN) and Mr Mefistou (PR). Each track is more than just a remix. It is a brand new interpretation of the main tune with each artist reconstructing the basic tune according to his unique style. Negritage makes a dirty rough rootical stepper out of it, Dub-I transforms the hard stepper into a musical dub experiment, Mr Mefistou incorporates the revolutionary speech of the Bolivian president Evo Morales after the trouble he faced in Europe due to his pro Snowden attitude, while Injham introduces a complete recut of the tune. Big versions by BBC Introducing Artist of 2012 Svaha Sound System and the Canadian Mr. Lion.